Clinton County News	» Congressman James Comer (KY-01) welcomed Tiffany and Brandon Norris of Albany, Ky. 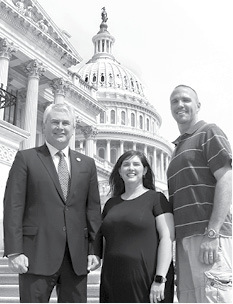 Congressman James Comer (KY-01) welcomed Tiffany and Brandon Norris of Albany, Ky.
to D.C. on Wednesday. While in Washington, the Norris family had the opportunity to tour the White House. They were also taken on a staff led tour of the Capitol building.